This house is a new property, in the middle of vineyard and with a fantastic view of the coast. 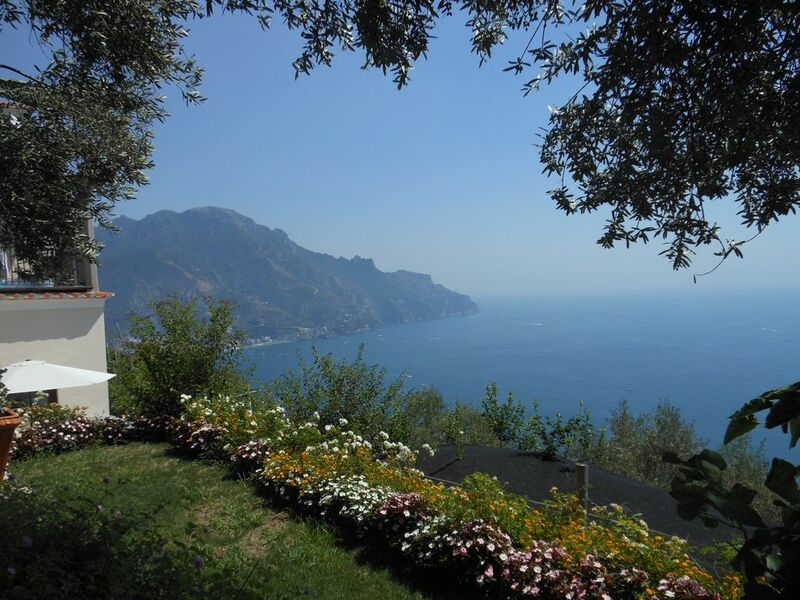 Perfect for people that don't mind to walk and enjoy the peace of the beautiful Ravello. ideal for people who like to hike and be surrounded by nature. i don't suggest to people who cannot walk fine or people who don't like stairs. There are 2 bedrooms 2 bathrooms to sleep and a very nice kitchen and terraces to relax. the House is right in the middle of a nice path which takes you from ravello to amalfi walking. The valet parking costs 20€ per day, they delivery and pick up car anytime you need. parking on the road costs 2€ per hour. Atrani is 25 min walking down the steps. i would choose this property for the view and for the quite. We had a great time in Ravello. It's a beautiful quaint town. Our host went out of his way to help us and show us where to park our car for less. You need a car for this location and be in good shape to climb many stairs. But the gorgeous house and amazing view are worth the climb! Smart, compact, yet spacious l.
We enjoyed our experience and Martin the homeowner. Great place! A Spectacular View in a very peaceful setting. This house is amazing. Downstairs from the main residence this house sits on the side of a hill ~850 steps above Almafi. Beautiful garden and small lawn overlooking lemon/olive trees. a wonderful family garden and a 180 degree of the coast.. It's an easy hike down to the house from where you will park or be dropped off. However, bring light luggage as the walk out is approximately 110 steps up and about 300 yards. If you plan on eating in, ask Tano for directions to the Market. We took public transit (cheap) to the beaches and to the town of Ravello (15 minute walk up). Plan ahead and be mindful of the transit schedules and that some buses do fill up. Tano arranged transit to and from Naples airport/train station and for a private tour of Pompei. Do bring a small amount of consumables for the first night (soap, food, paper towels, vino, etc.) as there is not a market close by and some shops close early. Wish we could have stayed another week. Highly recommended! Tano did a great job! We had a great time, awesome view of the ocean and surrounding area. Though the walk in was a little more than expected, Tano did take our luggage up to the house which was a huge help. You need to be in fairly good shape to walk up to the center of Ravello but again the view and restaurants make it worth the trip. This property is in the middle of a beautiful garden filled with flowers and fruit trees. The view is stunning. We looked up the hill from the path one day and recognized Gore Vidal's famous Amalfi Coast villa, The Swallow's Nest, a few hundred feet above us. The apartment itself is spacious, spotless and newly renovated with modern amenities (great air conditioning). Very comfortable. WiFi was available outdoors only because of the location of the router. Ravello is charming and a perfect spot from which to explore the rest of the coast, but you really won't want to leave your yard and the hammock hung between two olive trees. Tano, who grew up here and manages this family property, was a wonderful host, friendly and helpful. We loved our time here and would definitely recommend it to anyone looking for relaxation in a quiet, private paradise.